My Photos library has a few large videos in it encoded in HEVC. I am trying to export specific videos out of it in original quality, but I can't find a way to do this effectively. Airdropping seems to convert the videos first no matter what. I couldn't find any settings to make Airdrop transfer original-quality videos, either to another macOS or iOS device, even if they are above macOS High Sierra/iOS 11 (the requirement for HEVC playback). Using iOS's share sheet will also "Prepare" (or convert) the videos you're trying to share before allowing another app to open them. I used to put these videos into an album, open the Readdle Documents app, and then move all the videos from the album (which you can view directly from the Documents app) into a folder. I could then transfer this to my computer at my convenience. However, it seems like now when Documents requests the videos from iOS, iOS automatically converts the videos before allowing Documents to access (move) them into its own file system, thereby doubling the file size. I tried using Image Capture on macOS to import the videos to my Mac, which allows for the importing of originals. However, it's not possible to grab videos from an album this way. It's quite hard to find each video individually from the list to export. Does anyone know of some smart way to export multiple original-quality videos from the Photos app? I can transfer HEVC videos perfectly fine via AirDrop (iOS 12 → macOS Mojave). 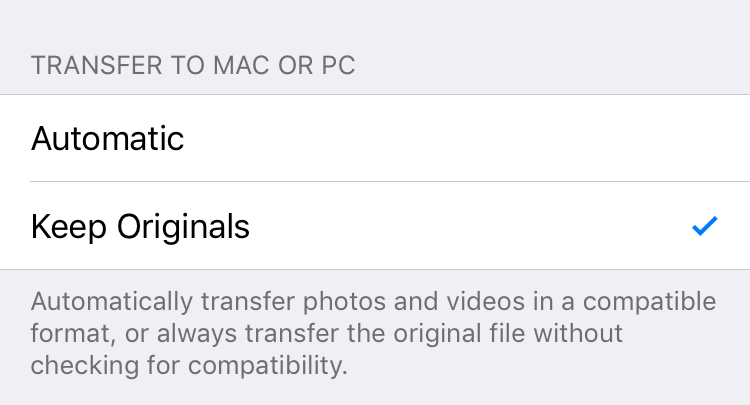 Please check the transfer settings in the iOS Settings app > Photos (last element). Setting should be "Keep Originals". Not the answer you're looking for? Browse other questions tagged ios photos video . I've tried to export from Photos to hard drive but it says my Mac Hard Drive is in “read” only mode How change so I can export? Export all photos/video from Mac Photos in a YYYY\MM-DD-Album Name format? Photos sync from iTunes mac osx to iOS/iPhone location unknown? Photos app - when I share a video to iCloud Photo Sharing - why does it get reduced from 1080 to 720? How can I move videos from Google Drive to Apple Photos on iPad?